Eran Privman, CEO of SpaceIL, authored this article with contributions from mission scientist Oded Aharonson and SpaceIL science team investigator Avi Barliya. The authors contributed this article to Space.com's Expert Voices: Op-Ed & Insights. With the goal of landing the first Israeli spacecraft on the moon, nonprofit SpaceIL is competing for the Google Lunar XPrize: a modern race to the moon. 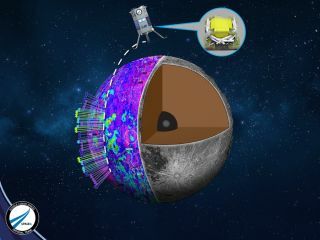 The competition promises a $20-million grand prize to the first nongovernmental team to soft-land an unmanned spacecraft on the moon, travel 500 meters (1640 feet) across the surface, and send high-resolution images and video back to Earth. Our team's approach is unique for two reasons. First, instead of developing a rover to drive 500 m like most other teams, SpaceIL engineers are pursuing a "hop" — using the spacecraft's propulsion system first to land, and second to take off again and land 500 m away. Second, we are using the mission not only to stimulate technological advancement, but also to investigate the lunar magnetic field: To that aim, SpaceIL will be carrying a scientific experiment that will advance humanity's shared understanding of the moon. The lunar magnetic field: the moon's "history book"
The moon has fascinated humans since the dawn of history, but there has been little lunar-surface research since the 1970s. SpaceIL is particularly interested in deciphering the secrets kept by the moon's crustal rocks. Although magnetized rocks were discovered decades ago, and astronauts returned some samples to Earth for research, the origin of the magnetic field presents an enigma — and an opportunity. Therefore, in its mission to the moon, SpaceIL will integrate a scientific experiment — the Lunar Magnetometer (LMAG) — to study the nature of this phenomenon. The magnetic field is like a history book that records events in the moon's geophysical evolution. Magnetized rocks await explorers seeking to unravel the moon's past. On Earth the core dynamo contributes the majority of the magnetic field, while on the moon, such a dynamo is now extinct, if it ever existed. But the rocks on the surface are magnetized today, sometimes strongly and variably. Measuring and mapping which rocks exhibit the field, and which do not, can reveal how that field was first acquired. Was it from a dynamo that has since met its demise? From impact? From meteoritic materials? And if the field was frozen into the rocks while the core dynamo was active, studying the ages of those rocks also serves to date the dynamo. SpaceIL will conduct its LMAG experiment in collaboration with a team of researchers at the Weizmann Institute of Science in Rehovot, Israel, led by Oded Aharonson, who directs the Center for Planetary Sciences there. Aharonson is a member of several science teams for NASA spacecraft venturing to other bodies in the solar system, such as the Mars Exploration Rovers and the Lunar Reconnaissance Orbiter. The SpaceIL mission LMAG sensor is being designed and built by a world-leading group experienced in spaceborne magnetometers, led by Prof. Christopher Russell of the University of California, Los Angeles. That group has also provided a similar instrument for the InSight lander bound for Mars. Our spacecraft will take LMAG measurements during orbit, descent, landing and throughout our ensuing mission on the lunar surface. The device will automatically start measuring from the moment we begin the spacecraft's landing on the moon: a 600-kilometer (373 miles) range to the ground. After the initial landing, the measurements will continue during the 500-m hop stage, as well as during and after the second landing. Thus, we will be able to investigate the field on a variety of spatial scales, and via time variability, revealing the electrical properties of the moon's interior. The most significant scientific challenge will be in the analysis and interpretation of the results back on Earth, which will be published and disseminated to NASA and scientists worldwide in the years to come. From our beginning, SpaceIL was established as an educational nonprofit organization. We will use our spacecraft technology, groundbreaking science, and historic mission to inspire the next generation in Israel and around the world. The potential prize money will be used to promote science and technology education in our country, but as importantly, we are committed to promoting science for the benefit of humanity. It is the nature of scientific research that knowledge advances in incremental steps. In deep-space exploration, each mission provides a few pebbles of knowledge that together fill in a mosaic of our understanding of the universe. SpaceIL's exploration of the moon's crustal rocks will uncover a few more pieces of this mosaic, making the picture sharper than ever before. SpaceIL believes that a small team from a small country can accomplish great things. In the past, space missions were conducted exclusively by superpowers with enormous budgets. Today, more and more commercial companies, smaller nations and even universities are pursuing deep-space missions. Initiatives like the Google Lunar XPrize encourage this trend, which has great importance for humanity. With our science payload on our small lander, we may even one day see SpaceIL and NASA working together on common goals.